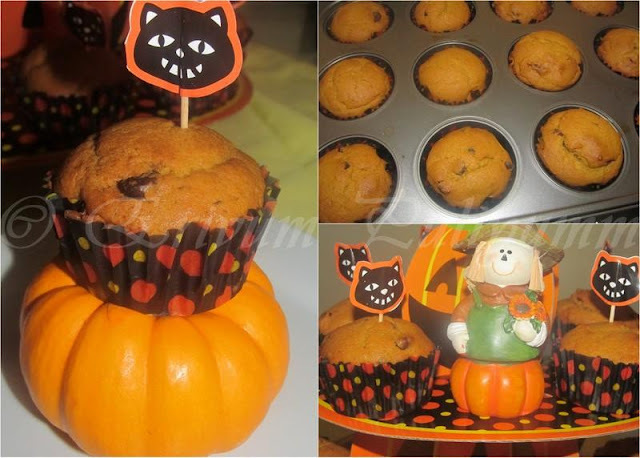 Baking Partners,this month came up with the theme,Cupcakes /Muffins for our challenge #3 and pumpkin as the main ingredient as we are approaching Halloween in another 2 weeks.This is a recipe suggested by Reshmi@ Easy Cook from Joy of Baking which is adapted form.This Pumpkin Chocolate Chip Muffin recipe is adapted from Baking from the Heart, a collaborative cookbook with Michael J Rose.Thanx to Reshmi and Swathi @ Zesty South Indian Kitchen for the wonderful recipe.Though am not a big fan of pumpkin and was a bit reluctant about the taste of muffins.But to my surprise,the muffins were very tasty with soft texture and had no dominant flavors of pumpkin.The original recipe calls for all purpose flour alone,I conveniently changed it to wheat flour & APF (refer notes for details).So,enjoy making these healthy delicious muffins for Halloween !! -Preheat oven to 350 degrees F (177 degrees C). Place rack in the middle of the oven. 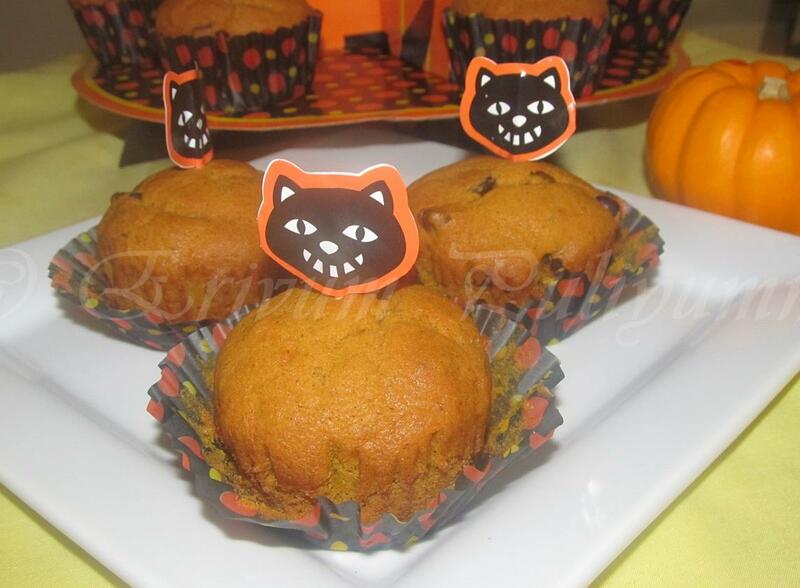 Line 12 muffin cups with paper liners or spray each cup with a non stick vegetable spray. -In the bowl of your electric mixer, or with a hand mixer, cream the butter and sugar until light and fluffy. Add the eggs, one at a time, beating well after each addition. Beat in the vanilla extract. Scrape down the sides of the bowl. With the mixer on low speed, alternately add the flour mixture and pumpkin puree, in three additions, beginning and ending with the flour mixture. Fold in the chocolate chips. If your batter is very thick,add the milk as mentioned. *The batter can be baked in a 9-inch (23 cm) loaf pan. Butter or spray the loaf pan with a non stick vegetable spray. Bake the loaf in a 350 degree F (177 degree C) oven for about 50-60 minutes or until a toothpick inserted in the center of the loaf comes out clean. * I have used wheat flour & all purpose flour in the recipe and so I have increased the baking soda to another 1/4 tsp. * I have used chocolate chips in seven and dried cranberries in another seven.Both of them tasted great. 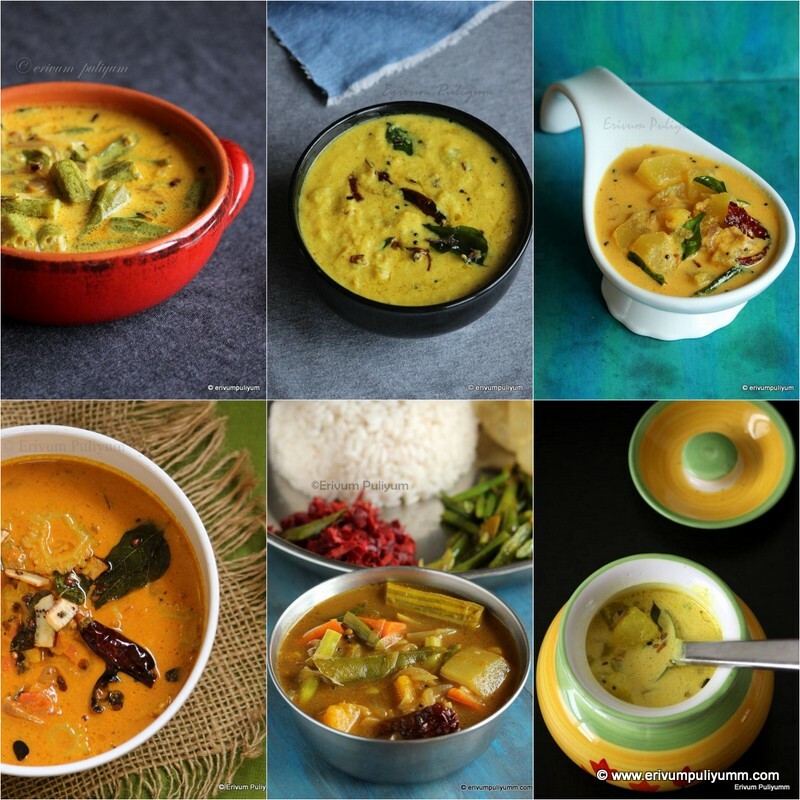 * I have used canned pumpkin puree from stores,you can use home made pumpkin puree too. * If you are using salted butter,then skip the salt mentioned in the recipe. 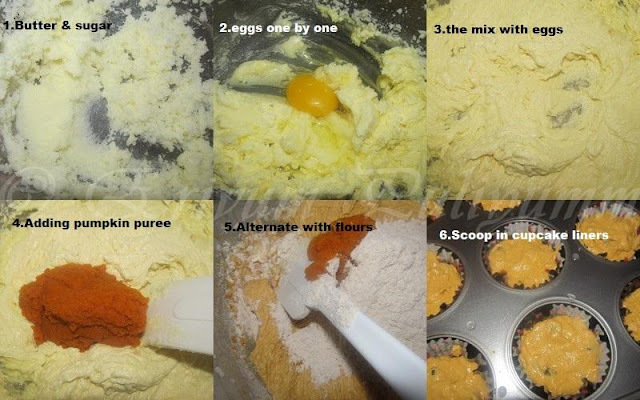 Healthy and delicious muffins.. Perfect presentation..
nicely grown and beatifully decorated! Colorful post Julie ........very very nice ! 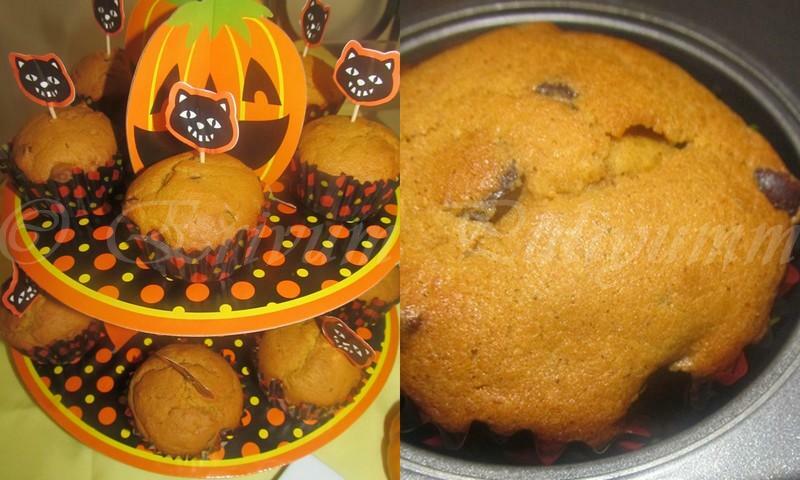 perfectly baked.. nice combo of pumpkin and choco.. Very cute presentation Julie...nice bake.. The colour looks so nice and the muffins are delicious! Very temptin muffins... By the way, I am also following u ever I saw ur blog dear .. That too publicly only... Don't u see me in ur followers list? 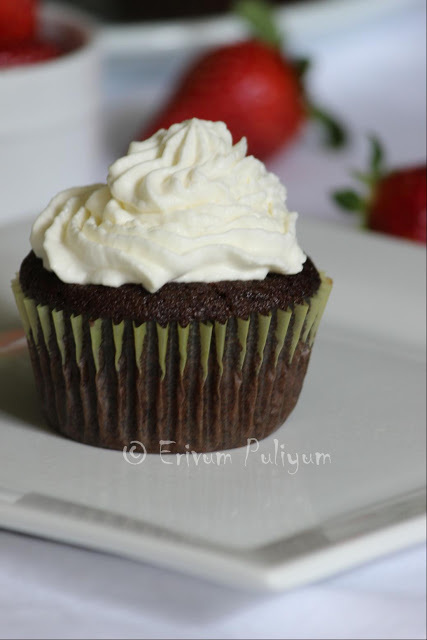 Delicious cup cakes,perfectly baked dear,we all loved it,adding wheat flour sounds great,healthy version,yum. 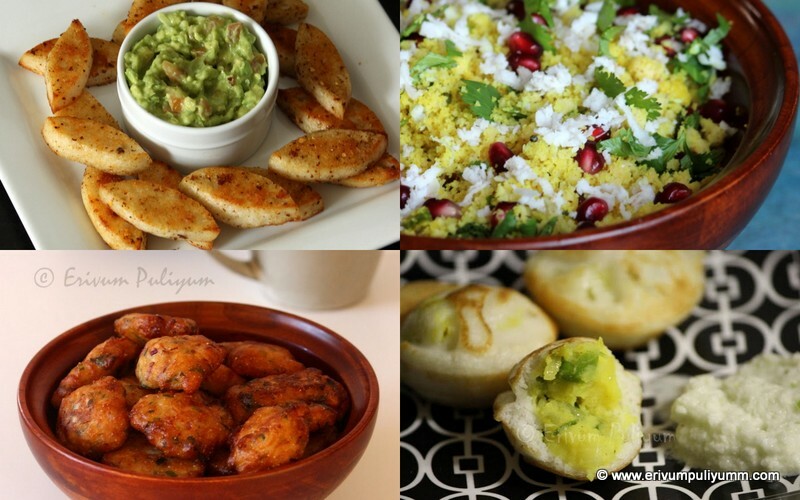 Adipoli ketto...Loved the presentation and the idea of making it healthy...Looks perfect dear.. Extremely irresistible and definitely healthy,fabulous looking muffins. 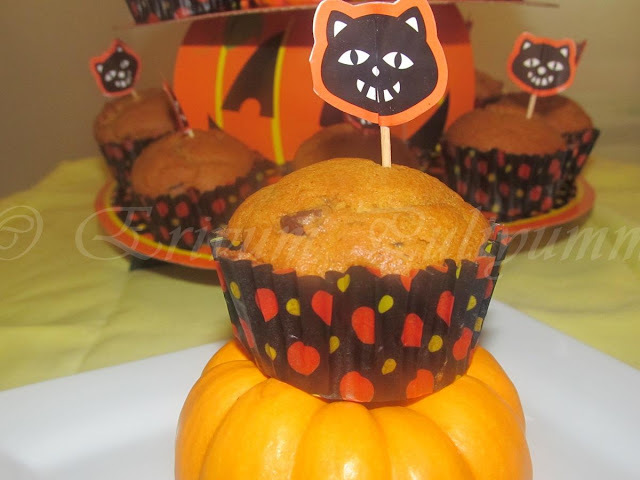 Pumpkin Chocolate chips muffins are nicely baked and wonderful presentation Julie. Love it. Delicious Julie, I love these muffin. Awesome. 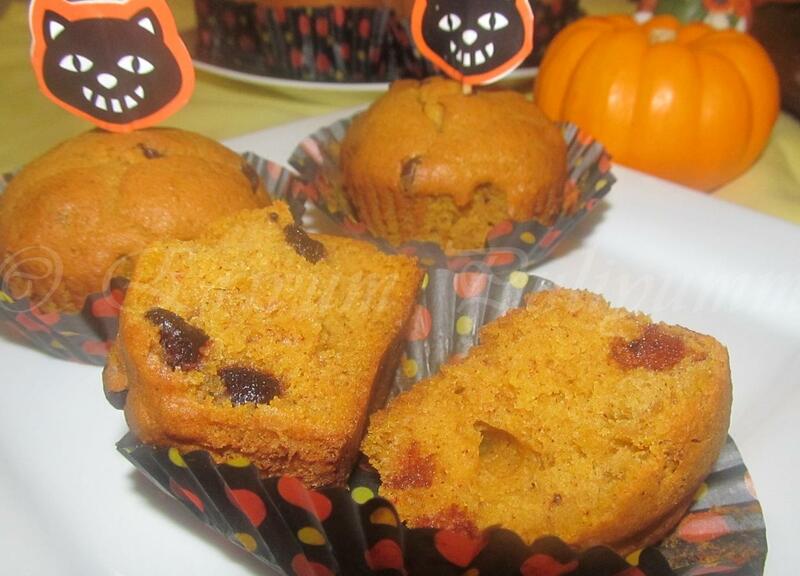 I made you guys baking with pumpkin. Yummy - love your little decoration piece! So yummy looking! Love the presentation! Cute presentation and yummy muffins. Love your all wheat version! This recipe sure is a winner. Muffin looks so colorful and delicious. Perfectly done. Lovely presentation, Julie. Wheat flour muffin!? Sounds great and looks yummy too! Healthy Muffins they look beautiful nice work dear. They look moist and fluffy. cute too. Love the gorgeous presentation! And my, you used wheat flour --- such a bright idea! Great job on this month's challenge! Awesome, kids would be excited looking at the decoration..
Wow.. Soo perfect dish for the season..